Taking a tiny break from writing about Doggerland. Of sorts. Here are some other things that have been happening.. + BBC4 continues to have unlimited access to my brain. They have just started an archaeology season, for heaven's sake. If you have access to BBC iPlayer, I recommend watching The Peat Bog Mystery. It first aired in 1954(!) and it is an excellent insight into how archaeology was communicated to the masses. No gloves when handling artefacts! Lady archaeologists get to talk about cooking! Sir Mortimer Wheeler is especially fascinating (just check out his wikipedia page). Also, the artefacts themselves are fabulous and you get to see some of the highlights of the National Museum of Denmark including an awkward assessment of the Gundestrup Cauldron ("Nazi eagles"!). + I was very amused by this news story: the author of Fifty Shades of Gray went to a Romance Book convention/trade show under an assumed name, unveiled her real identity interrupting a panel discussion before telling them to "stop talking about my book!". Good times. I wound the yarn last night for a quick swatch. It is quite variegated compared to the semi-solid sock yarns I have been using over the last couple of years, but the variegation works pretty well. 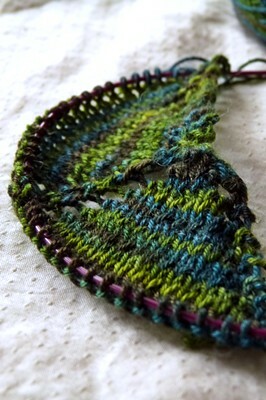 For shawl design purposes, I think you'd look at slipped stitches, textures, and well-defined big-chunks lace. The base is interesting - it has a fairly tight twist compared to other commercial sock yarns but not quite the high twist you get from, say, Wollmeise. The silk makes for nice drape + sheen. 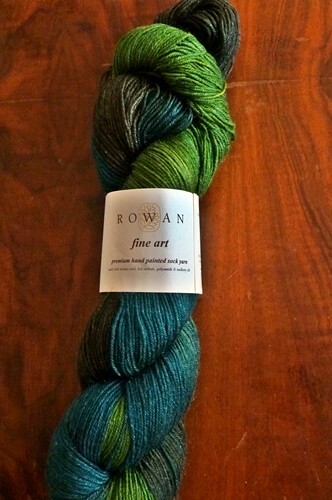 Such a contrast to the rustic yarns I've worked with over the last few weeks. + I found a photo from my old primary school the other day. This was taken a few years before my time, but I loved it as soon as I saw it. Look at all the handknits! And do I spot handknitted socks on the young gent on the left? My friend Kaisa told me the photo looked like a cross between Grange Hill (British kids' show) and The Killing. She may have a point. + Finally, the fine people of the Netherlands have a new king. Seeing I am not a royalist, that shouldn't really register on my radar. What did register was Garnstudio's patterns they released to coincide with the coronation. Fun little fact: my first knitting project in many, many, many years was a little stripy cotton jumper for the little Queenie when she was first born. Isn't it strange how life works out? It is a funny old life.